An artist’s obsession with a female muse exquisitely illustrated with linoleum cuts. The surprise ending reflects a genuine artistic dilemma. 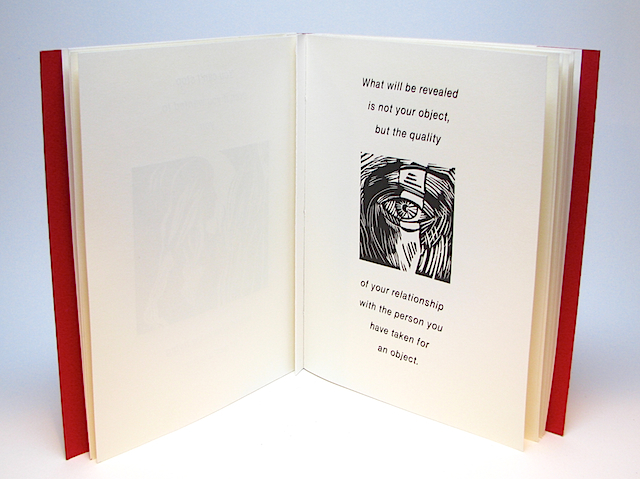 Letterpress printed on Mohawk Superfine in black, Handsewn, hand bound concertina style in a soft red cover. 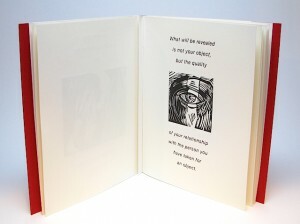 Colophon: Linoleum cuts printed on a Challenge proof press. Text printed on a Miehle Vertical. The text typeface is Helvetica Oblique. 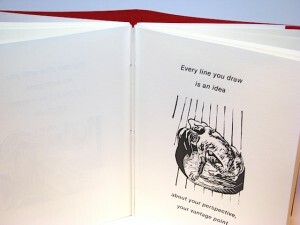 Handbound by the artist. Thanks to Timothy Fay of the Route 3 Press, Anamosa, Iowa for facility and technical support.